July 6, 2012 posted by Len B. “Betcha can’t eat just one!” I remember when that now-famous potato chip slogan first appeared in television commercials back in the 1960’s. The implication was that their chips are so tasty, they’re addictive: once we start eating them we simply won’t be able stop. It may have been a snack food company that originally came up with this marketing concept, but it’s the tobacco companies that have been banking on it all along. They know how addictive their products are and are fully aware that we “can’t smoke just one.” I learned this lesson quite well the very first time I tried to quit smoking. I was 18 years old and had been smoking for about three years. I kept telling myself that I wasn’t like everyone else and would never allow myself to get hooked on cigarettes. 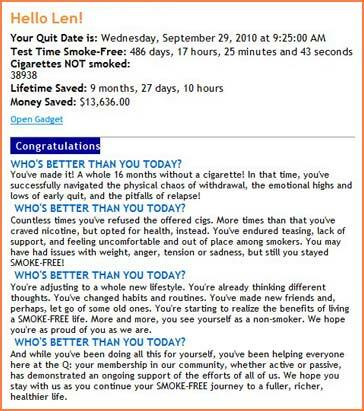 To prove it, I decided to quit at that time and was successful for about six months. Then, I made the mistake that all too many of us make: I decided to smoke “just one” to remind myself of what it was like to be a smoker. BIG MISTAKE! All it took was that one cigarette and I went back to buying them by the pack. More than 40 years later, it’s now been nearly two years since I quit smoking once and for all. This time I know how dangerous it would be for me to “smoke just one.” Whether I’ve been quit for six weeks, six months, or six years, I can never allow myself to take even one puff of a cigarette because I know the consequences all too well. If forced to make a choice, pass me the chips! February 7, 2012 posted by Len B. There are several things I can say about Rodney and his situation(s). First of all, it was commendable for him to allow his down-and-out brother-in-law to move in with him. But, as for allowing him to smoke inside his home?? That was mistake number one. At the very least, he should have insisted that all smoking AS WELL AS ALL SMOKING PARAPHERNALIA be kept outside the home and well out of sight. Rodney’s second mistake was in thinking that he could have just one. No addict can ever have “just one” (and that’s just what we current and former smokers are: addicts.) Rodney should have been more in control of his own living space. If his brother-in-law refused to comply with his no-smoking policy, then he should have been shown the door. Period. And now we come to the present day “mistake” that was made by Rodney. If just the smell of smoke is so tempting to him (which is usually the case for recent, if not most, quitters) then he should NOT be sitting at a blackjack table where smoking is allowed. He should make it a point to avoid all places and areas that allow smokers to blow their smoke in all directions. To do so is to invite temptation. February 2, 2012 posted by Len B. Most of us who have been able to quit smoking for substantial lengths of time have come to realize that it takes more than just willpower to be successful. In fact for many of us (myself included,) we had to arm ourselves with a variety of “weapons” and other tools to beat our addictions. These included medications such as Bupropion®, nicotine replacement therapies such as lozenges, gum, patches, etc, classroom training, one-on-one counseling, group support meetings, and more. In addition to all of that, I found some very effective assistance and support on the Internet. One web site I found that was of great value to me personally is called QuitNet.com®. Registering for QuitNet.com® is free. They do offer a higher level of service for which they charge a nominal fee, but I found plenty of value as a free member without having to pay. In addition to the various articles, testimonials, tips, and other information found on the site, there are chat rooms where one can always find other quitters at any time of the day or night. These “watering holes” come in very handy when you’re craving a cigarette and need someone to “talk” you through the moment without lighting up. In those chat rooms you’ll find people who have just quit that very day, as well as others who have been successfully quit for weeks, months, or years. Quitting smoking is serious business that requires us to take advantage of every available tool in order to help us reach and maintain our smoke-free goals. QuitNet.com® is yet another one of those valuable tools. You are currently browsing the archives for the Preventing Relapse category.